When covering David’s speech at the World Islamic Economic Forum (WIEF), I made the analogy of David being a test match cricket captain looking to field a team able to clock up runs, bowl some yorkers, and grab wickets on the fast paced field of Muslim markets – now spearheaded by economic models which draw from Islam. Well captain he is, as David was reported last week as even describing himself as batting for Britain in the Gulf. Now, London is well placed alongside Dubai and Kuala Lumpur, right? We use the same 3 pin plugs and share a love of English Premier League football – and they were our idea. But this week Dubai pulled away from the pack and laid down some markers, which mean that we’re all playing catch up. 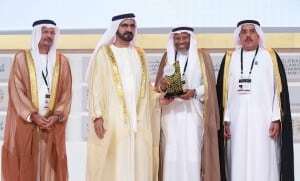 HH Sheikh Mohammad Bin Rashid Al Maktoum, UAE Vice President, Prime Minister and Ruler of Dubai inaugurated the first Global Islamic Economy Summit (GIES) on the 25th and 26th November, in collaboration with the Dubai Chamber of Commerce and Thomson Reuters. He gave out 14 Islamic Economy Awards at the Summit. A blistering 45 days of preparation yielded a slick event attracting over 3,000 delegates, and I was lucky enough to be one of the speakers. The difference between WIEF and GIES? GIES was free entry. That included the gourmet food throughout the two days; a gala dinner; free Wi-Fi enabled tablets (for keeps), uploaded with an interactive conference programme app and everyone’s contact details; and live video streaming of the event byAmilin TV. WIEF had more world leaders, and less representation from the Arab world and North America. But really, trying to separate the two events is a bit like trying to decide if you prefer DC or Marvel comics. Driving through Dubai I saw posters everywhere for the GIES. Taxi drivers also spoke with pride about Dubai’s World Expo 2020 campaign. Monday 2nd December is the 42nd National Day of the United Arab Emirates, and in preparation there are any number of cars with their bodywork film wrapped in UAE colours, flags and slogans. It’s a pleasant 25 degrees Celsius there, and whilst we’ve seen some great Rugby on our shores this weekend, Dubai also hosted the Rugby World Sevens Series. Dubai knows how to market, create a buzz, and deliver a memorable experience. English is the language of choice in Dubai, and just like in London you hear accents from all over – Mancunians, Glaswegians, Londoners, Home Counties, New Yorkers, Calis, Filipinos, Pakistanis, Indians, Spanish, Dutch, Italian, Kazakhs, Malaysians, Moroccans, Egyptians, Emiratis and many more. These weren’t just from delegates that came especially for the event – these are people who now call Dubai their home. I spoke to Baroness Warsi, Senior Minister of State at the UK Foreign & Commonwealth Office, at both WIEF and the GIES – and its clear from her list of engagements and our interviews conducted whilst walking briskly through eager crowds that UK plc is serious about Brand Islam, and the feeling’s mutual from other nations. The challenge however, is whether the UK can stay on the pace. An estimated total funding of €6.5 billion has been earmarked for the 2020 Dubai Expo, with €5.2 billion anticipated as capital investment for the Expo’s infrastructure environment. Dubai’s economy is also set to receive an added value boost of roughly €17.7 billion, and there will be a race to recruit top talent. So are we going to see a brain drain from the UK? But why the shift towards an Islamic economy, rather than just economic growth? Well, if we put the argument to one side for Muslims having to practice what they believe in and preach, according to their faith, then there are other benefits. Indicators are that the strength of an Islamic economy is that it resonates with Muslims eliciting greater feelings of authenticity, ownership and engagement – which in turn drive loyalty. Islamic finance and banking has grabbed many headlines, but a recent survey by the World Bank, shows that only 2% of the 5,000 Muslims surveyed in Algeria, Egypt, Morocco, Tunisia, and Yemen use Islamic banking services. So there’s still plenty of work to be done and there’s great growth potential. Thomson Reuters and DinarStandard published their report on the Global Islamic Economy. Currently, Halal is the real powerhouse, with proven demand results, especially in the wake of recent food scandals. Where consumers in Muslim majority countries thought that Halal was a given, now more are seeking reassurance through an additional layer of certification and quality control – alongside other trends like organic, and Fair Trade. Malaysia has traditionally been used to certify products in the UAE, but now Dubai will be setting up its own accreditation body. This in many ways mirrors a bigger trend, where globalization and mass production, is juxtaposed with a desire for humanized, nuanced, and more cultural commodities, linked to moral codes of ethics. So just like switching from full fat coke to zero, light, or diet; or maybe even the new ‘green’ Coca Cola Life: the crescent moon of the green dinar is rising. And, a key take home from the conference speakers and reports is that there appears to be strong interest from non-Muslims who see a value in many of the same universal principles and ethical stances espoused at the summit. I think this also signals that the role of faith in business and consumerism across religions is on the rise. But whether we see Buddhist economics, Zen banking, or Kosher finance – who knows?